I thought I knew Italian cuisine when I arrived in Italy in 1998 for what turned out to be a fifteen-year sojourn. I may have been able to recognize Italian food, but I had no clue about the Italian Food Rules. I broke every single one of them. The Italian Food Rules have a long history. Some traveled with Catherine de’ Medici to France in the 16th century. Others are even older. Despite the attempts by outsiders to influence the politics and cultural life of the Italian peninsula for the past millennium, the Italian people have remained largely homogenous. They will argue there are insurmountable regional differences in their recipes, but outsiders will be hard pressed to understand what all the fuss is about. Since Italians do not generally move far from home, the food traditions are passed on unchanged from generation to generation. Italian Food Rules practiced 200 years ago are still valid today. The Italian food culture encourages eating foods that are in season and grown locally, which could be considered two of the most important Italian Food Rules. It is little wonder that the Slow Food movement started in Italy. Founded in 1989 in the Piemonte region to counter the rise in Italy of fast food, the organization’s interests grew to include the disappearance of local food culture and traditional ingredients. Slow Food is now a grassroots organization with over 100,000 supporters in 150 countries around the world, who are linking the pleasure of good food with a commitment to their community and the environment. 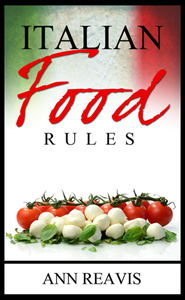 The organization’s philosophy has its basis in the Italian Food Rules. This small book just skims the surface of the Italian Food Rules. Although some Italians might rightly argue that one or two of these Rules don’t apply to their region or their small town, this book is meant to be of some assistance to the visitor who wants to try to be Italian at least once in a lifetime. To order a cappuccino after lunch is a direct and major violation of an Italian Food Rule. Italians believe the fresh whole milk that makes up over half of the contents of cappuccino plays havoc with digestion. To order a cappuccino after 10am, unless you are breakfasting after said hour, is seen as suspect behavior worthy of at least a slight frown, advancing to a worried shake of the head, and can escalate to outright ridicule. To the Italians, milk is almost a meal in itself. So having a cappuccino at the neighborhood bar in the morning on the way to work or school requires no other food to be considered a complete breakfast. (A small pastry may be included, but not always.) Cappuccino is more milk than coffee, so it is full of calories. Perhaps the reasoning is that slender Italians (the ones who don’t order the pastry) are more likely to burn off the calories through the day. Drunk later, those pesky calories stay on the hips. The real reason behind the Food Rule, however, is that Italians are firmly convinced that drinking milk after any meal will mess up the stomach’s ability to digest food properly. So having a cappuccino at any time after lunch, or after dinner, in Italy is unthinkable. No slice of lemon or lemon peel with espresso. If you must have milk in your after-meal coffee, order caffè macchiato (stained coffee). Coffee can be served with a shot of alcohol (grappa, cognac, rum), order caffè corretto. There are no frappuccinos in Italy, order caffè shakerato. Caffè is to be drunk standing at a bar or at the table after a meal. Italians do not order double espresso – espresso is a short drink.